She looks great, Karl. Really happy for you. Karl, I'm really looking forward to seeing your beautifully built hull with her attractive sail installed. 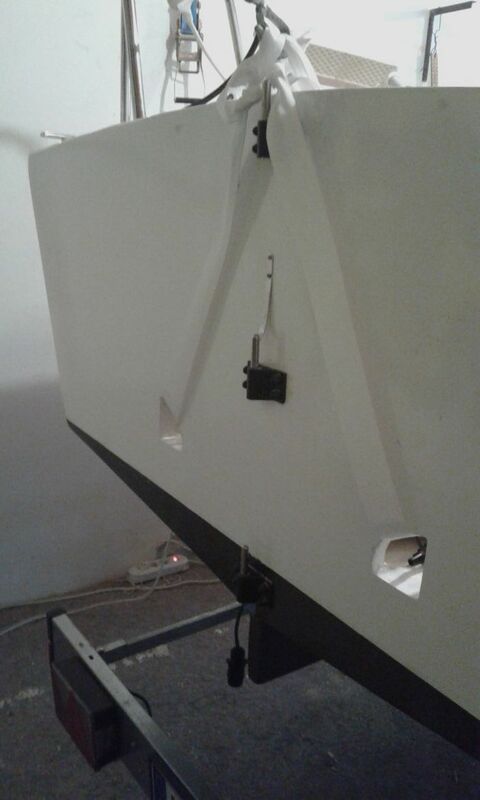 When speaking about the numbers on the bow I forgot about the unusual shear on your boat. I think you should, absent regulations to the contrary, put them where they look best to you, and see what the other AD builders have done. 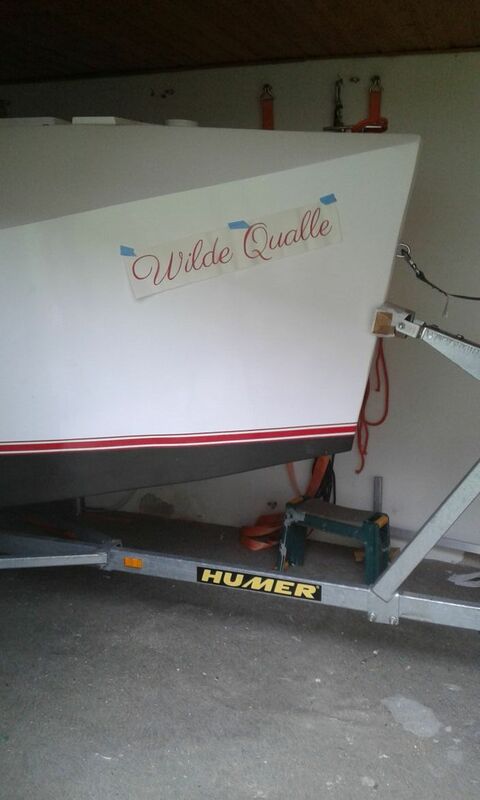 Thank you Tony for the shear suggestion and as there are no regulations for a boat as small as mine anything shorter than 4,5 meters is considered flotsam and needs no registration I really can put the name where it looks best. My brother in law also a captain like you had the same idea as you and suggested to follow the shear line which goes well with the letters leaning to the right. Today I mounted temporarily my skids on the trailer and put the boat on top. Looks ok but I have to order 2 universal couplings also for the 2 rear support of the skids which I only mounted on the 2 supports near the bow. 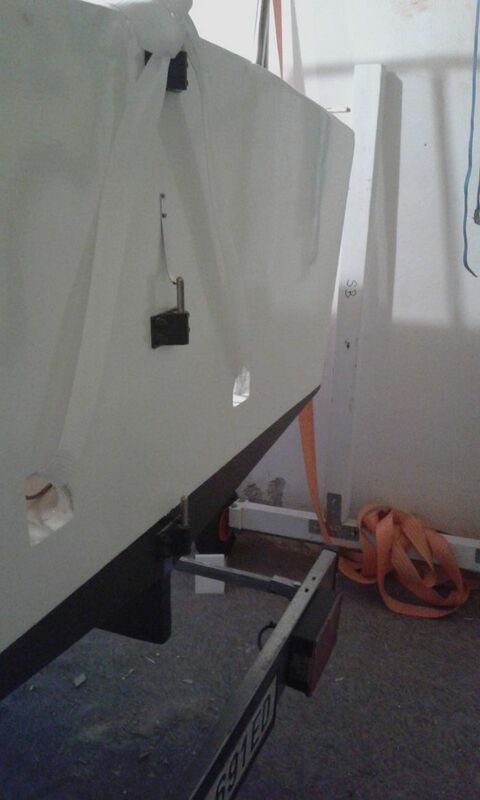 I thought the boat is rather flat near the transom but it does swing up and to the side so that I need the cross joint couplings there as well. I also got the tongue weight down to 39 kg. 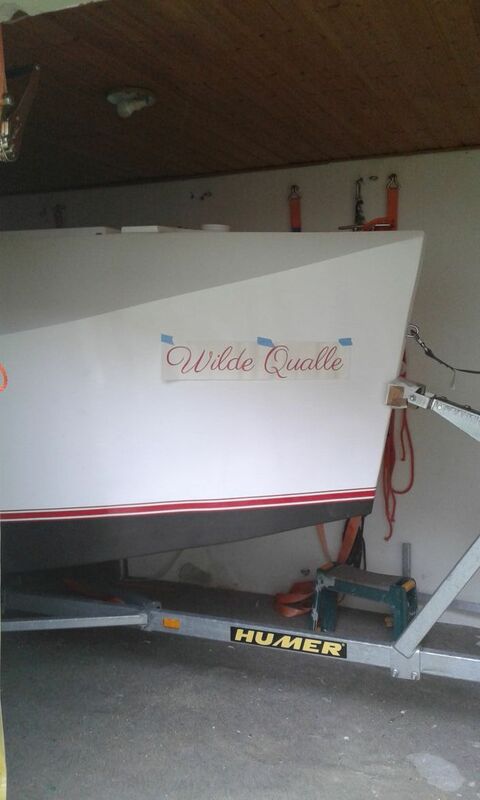 Tomorrow I will get it down a bit more by moving the boat a bit further back on the trailer and then the Wilde Qualle name will be stuck to the 2 bow sides. now I'm really thinking about those letters... What about on the upper part following the shear? Or is that what we are talking about? I've been known to be behind when if comes to thinking. Are you planning to put her name on the transom? That might look nice too. Yes I have decided to let the name follow the shear line but not so steep that the first letter W falls sort of backwards. On bigger boats it is usual to put the name and home harbour town onto the transom. 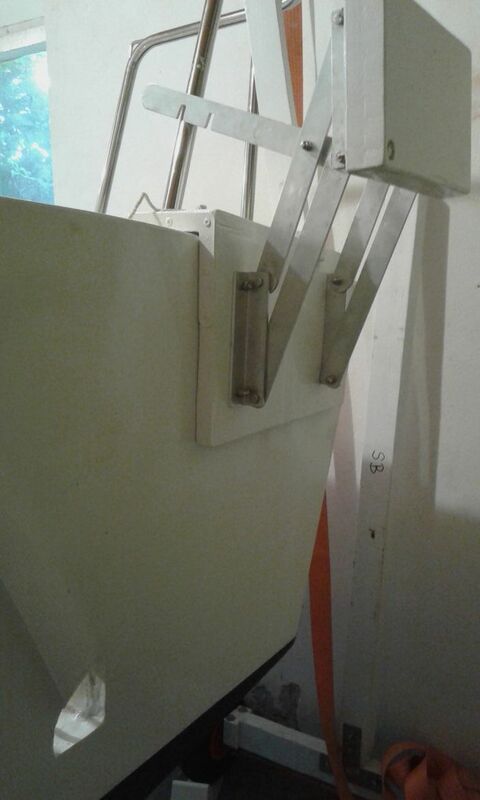 I do not want to do that because my transom is rather small and I like it nice and white without anything on it except the rudder hardware wit 12 screws. and here the outboard bracket taken away within 30 seconds.